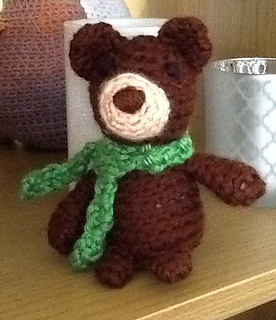 I hope you enjoy making Ruthie the Tiny Bear! 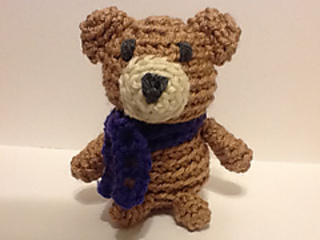 This darling little bear stands about 3.5 inches tall using worsted weight yarn. It has a special pattern included to create a sling or messenger bag so that you can add a special note! It also has a pattern for a scarf to keep her warm. Sample made in worsted weight (Hobby Lobby Almond) - approx 50 to 80 yards total to complete this pattern. Messenger/Sling bag and scarf made with scrap yarn.